What Are the MOST Popular US College Majors by State (INFOGRAPHIC)? US students often face the problem of choice. Should they be studying in their home state? Or maybe, pursue higher education in other states? Which college major to opt for to guarantee steady career perspectives? The Typical Student team decided to figure the answers to these crucial questions. Specific college majors can be more popular than others in particular US areas. The choice can be tough, especially if you’ve set eyes on uncommon fields of study like oceanography, soil sciences, or astrophysics. 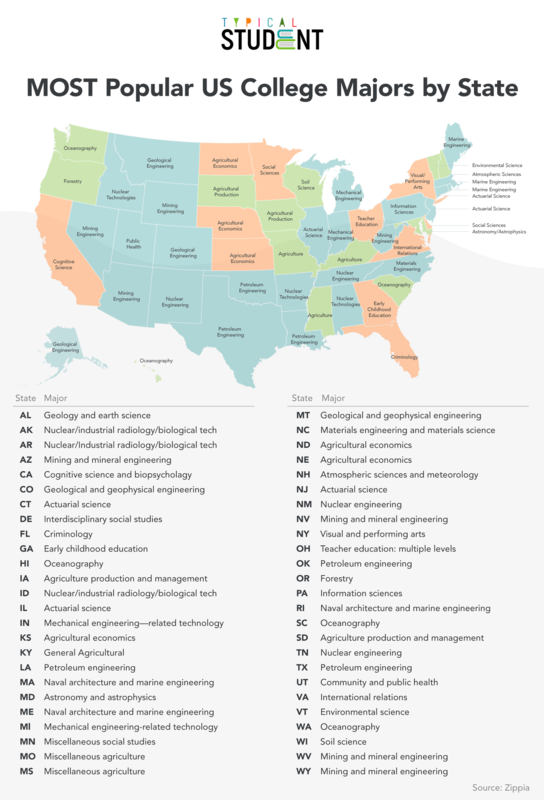 Want to learn the most disproportionately popular college major in every US state? Based on the survey conducted by US Census Bureau, career website Zippia has figured that out. Guys at Zippia divided the number of major's degree holders in a particular state by the overall population. After that, they compared the figures with the nationwide rate. Maine has two majors with the highest location quotient of 13.84 - Naval Architecture and Marine Engineering. Pennsylvania ranks the lowest by location quotient of 2.04 for Information Sciences major. Georgia has the highest major count for the number of unique degrees in Early Childhood Education (26,284 students). Hawaii, South Carolina, and Washington rank the highest for oceanography. Take a look at the infographic below to see the most popular US college majors by state.